(Jan. 29, 2018) -- A new study by Chad Furl, postdoctoral research associate, and Hatim Sharif, professor of civil and environmental engineering at The University of Texas at San Antonio, delves into the 2015 Wimberley, Texas floods that destroyed 350 homes and claimed 13 lives. Furl and Sharif researched the factors that led to the catastrophic flooding and shed light on new ways people in flood-prone areas can protect against future tragedies. On Memorial Day weekend in 2015, the Blanco River rose to a record 40 feet. The swift rise of the water is known as a flash flood, a term familiar to Texans. 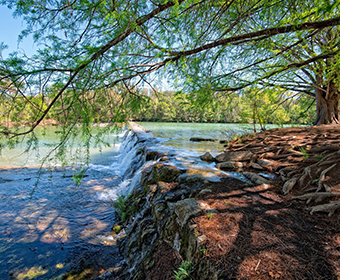 The Texas Hill Country, where Wimberly is located, is known as “Flash Flood Alley” because it leads North America as the most flash-flood prone region. The rugged landscape tends to contribute to this moniker, in addition to urbanization. As natural areas become more and more developed, floods become more likely to occur because accumulating rainwater slides off concrete structures with nowhere to go, whereas plants and soil absorb that moisture. Furl and Sharif also say that flash floods are common in Texas due to its two heavy rain seasons in spring and fall that cause the soil to become oversaturated with rainwater. Another significant contribution to the tragic floods was the movement of the storm over Wimberley and neighboring areas around the Blanco River. Furl and Sharif’s study additionally points out that 2015 was an unprecedented year for flooding, breaking several records. However, the researchers also saw those new records broken again in 2016 and 2017, and call for more attention to be paid to these clear, unsettling warning signs. Civil engineers like Furl and Sharif use the terms “500-year storm” and “100-year storm” to refer to weather events that measure the probability of a similar disaster happening in the future. In the past five years, Flash Flood Alley has seen two “500-year storms” and one “300-year storm.” The researchers call for better storm preparations in light of this revelation, to allow for blocking roads and evacuation of residents. Learn more about the UTSA Department of Civil and Environmental Engineering.